Second convention of 2016 So the second convention of 2016 comes to a close, half way through the Formby year and doesn’t time fly? Another good attendance on Saturday but slightly down on Sunday but then again, there was beginners class, an “up and comers” concert and a calfskin vellum replacement tuition, so sometimes when the concert room doesn’t look as full as we would like, it is odds on that the members are in some other room absorbed in other Formby related activities. The George Formby tram One new activity was a ride, on Sunday morning, on the George Formby Blackpool tram. For one hour 52 members enjoyed the sunshine and the sights of Blackpool as they paraded up and down the promenade playing their ukes. This is the first time we have really had any involvement with the famous tram since the unveiling ceremony but everybody said how much they enjoyed the experience so surely we must repeat this exercise on a regular basis. More of Gerry! 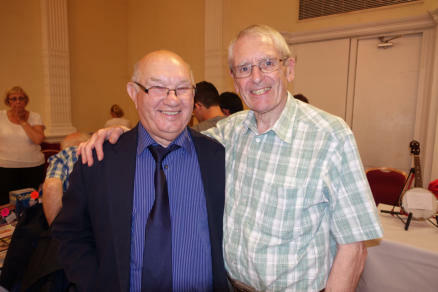 First compere of the day was Dennis Lee and his first task was to introduce the President of the George Formby Society, Gerry Mawdsley who (considering the recent mass media publicity that Queen Elizabeth is a Formby fan), came on stage wearing a mask depicting that gracious lady! Gerry even spoke in a high pitched queenly like manner which convinced some that perhaps he might go even higher than the role of President of the GFS! 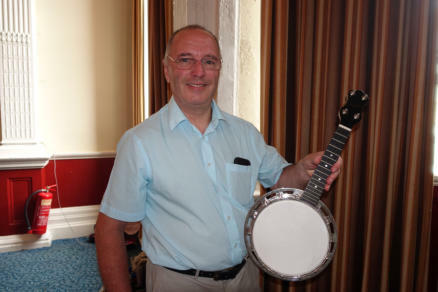 Gerry then produced this year’s ukulele-banjo raffle prize (to be drawn at the September meeting) and to demonstrate the quality of the instrument, played the solo to “The Window Cleaner” which must have led many in the audience to wonder why we don’t see more of Gerry performing on stage. He is a top class player with all the strokes and many who attended would benefit from studying his style of play. Maintaining the ‘royal’ theme, Jon Baddeley was first entertainer on stage and his rendition of “Levi’s Monkey Mike” also included an intro featuring the national anthem. A good variety of Formby songs And so the afternoon continued with a good variety of Formby songs and a smattering of non-Formby. It might be of interest if I share some stats with you, over the weekend I filmed performers doing 166 songs with just over 80% being from George Formby’s catalogue. They say that variety is the spice of life; I believe that the mix of entertainment is just about right. 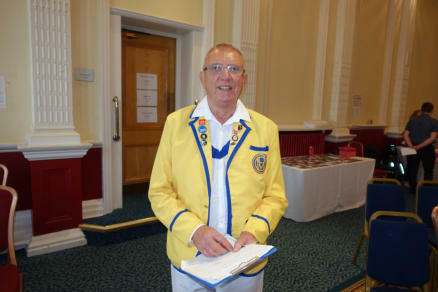 Members do enjoy their fellow performers playing new or popular material but of course the reason why we assemble in Blackpool four times a year is to remember George. 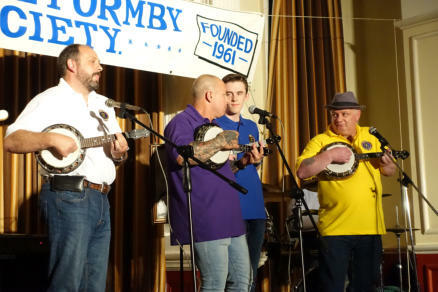 It has to be said that some performers just want to do that, perform – and they are not too bothered what they offer – so sometime ago the committee decreed that Saturday and Sunday afternoon’s player’s performance should always have at least one Formby number. Most popular songs over the weekend were (as usual) Leaning On A Lamp Post, Little Stick Of Blackpool Rock and The Window Cleaner. The most featured character was of course Mr Wu who was mentioned in nine performances., A busy Saturday Saturday evening which is a shorter concert because of the cinema, the raffle and the auction has to be all Formby (although that rule gets abused now and again), but it is always a very good night's entertainment. On Sunday evening, anything goes. I think that the rule is a good one, I have enjoyed some brilliant non-Formby performances and yes, there is room and talent will come through always. But we must never forgot what and who we are, the George Formby Society. With regard to the weekend's cinema, we have now dispensed with a DVD player and rely solely on a computer media player and computer files of all Formby's films. This ought to ensure that there will be no more sticking DVD discs and perish the thought, but should the computer hard drive ever fail, there will also be a backup available. 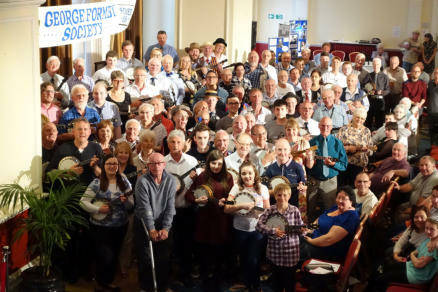 The next convention The next convention (September 17 and 18) is very important as it is the 55th birthday of the GFS and also the Annual General Meeting which takes place on Sunday morning. Please try to be there on what is sure to be an historic and memorable weekend. 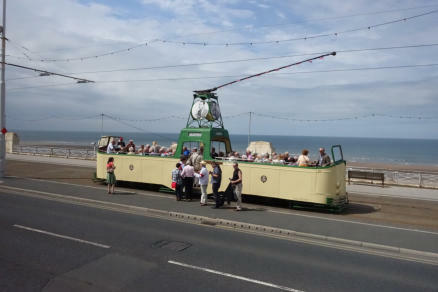 Riding on a Blackpool tram!